"Despite strong Vatican opposition, one group is preparing to ordain Cincinnati’s first Roman Catholic woman priest on May 25. The Association of Roman Catholic Women Priests (ARCWP) already ordained a woman priest in Louisville, Ky., and it’s hoping to carry the movement around the country, including Cincinnati. The Vatican and local Catholic leaders oppose the movement, and the ordination isn’t technically legal under the Catholic Church’s rules. But ARCWP says its ordinations put pressure on the Vatican to pull back rules that are keeping it in the past. Locally, Debra Meyers will be ordained as the first Catholic woman priest. Meyers holds a Ph.D. in history and women’s studies and a master’s in religious studies. She is currently a professor of history and women’s studies at Northern Kentucky University, and she also serves the Resurrection Community in Cincinnati where she promotes equality and social justice. For Meyers, this is a chance to break the glass ceiling and prove women can take up the highest roles in Catholic organizations, which she says is a necessary next step for the Church to keep up with the times. CityBeat interviewed Meyers about her ordination." The full interview, edited here for clarity and brevity, is available at citybeat.com. Lunch with Christ Sophia Community Louisville/ Janice Sevre-Duszynska's garden in KY.
Janice in her garden in KY.
Is The Cincinnati Enquirer Afraid of the Archbishop of Cincinnati? Why would The Cincinnati Enquirer not cover an ordination because it is “illegal” in the Roman Catholic Church? We sent The Enquirer the press release for the Saturday, May 25th ordination of Cincinnati’s first woman priest, Dr. Debra Meyers. She will be ordained at 1 p.m. at St. John’s Unitarian Universalist Church, 320 Resor Avenue in Cincinnati 45220. The local media has covered our ordinations across the country because they are news and of interest to the public. Reuters and The Louisville Courier Journal covered our recent April 27th ordination of Dr. Rosemarie Smead in Louisville. We wonder why The Cincinnati Enquirer is not interested? Does it have anything to do with the institutional church’s stance on women priests? Women priests are leading the Catholic Church into a new era of justice and equality for women in the church. We are the “Rosa Parks” of the Roman Catholic Church. We think a news blackout by The Enquirer because we are “illegal” according to church authorities is one view, but not the view of the majority of Catholics who would welcome news of the first woman priest ordination in Cincinnati. On Saturday, May 25, 2013, Dr. Debra Meyers of Batavia, Ohio will be ordained a priest in the Association of Roman Catholic Women Priests. The presiding bishop will be Bridget Mary Meehan of Falls Church, Virginia and Sarasota, Florida. The ceremony will take place at 1 p.m. at St. John's Unitarian Universalist Church, 320 Resor Ave., Cincinnati, Ohio 45220. Media are invited to a pre-ordination conference on Saturday, May 25, at 11:30 a.m. at the church with the candidate and Bridget Mary Meehan. Call Janice (859-684-4247) to schedule an interview. Respectful filming/photo taking during the ceremony is acceptable. The ordained is theologically prepared and has many years of experience in ministry. Dr. Debra Meyers earned a Ph.D. in History and Women's Studies and a MA in Religious Studies with an emphasis on pastoral care. The author of several books, she is a professor of History and Women's Studies at Northern Kentucky University. Her ministry focuses primarily on single mothers and their children who make up the vast majority of impoverished people in our country. She also serves the Resurrection Community in Cincinnati where they are living the Gospel of equality and social justice. Dr. Meyers is a wife, the mother of two successful children and a grandmother. "God called me to the Catholic priesthood as a child and every step of my academic and spiritual life as well as my social justice activism has prepared me to serve God's people as a pastor," said Dr. Meyers. "I thank ARCWP for the opportunity to fulfill God's call." Since two-thirds of the world's poor are women, justice and equality must be top priorities for our church. Our world and church can no longer function without the voices of women's lived experience. Women priests are visible reminders that all women are images of God. On March 13, five hours before the new pope was elected, a woman priest celebrated Mass in Rome. The church is at a crossroads with a new pope and women priests. This paradigm represents a holy shakeup and is pregnant with potential for renewal and change. Pope Francis's simplicity and solidarity with the poor and marginalized is the Good News that Catholics have been waiting for. Now is the time to embrace women. We are encouraged by the tender gesture of Pope Francis who washed the feet of women in prison on Holy Thursday, thus breaking the sexist tradition of washing only men's feet. 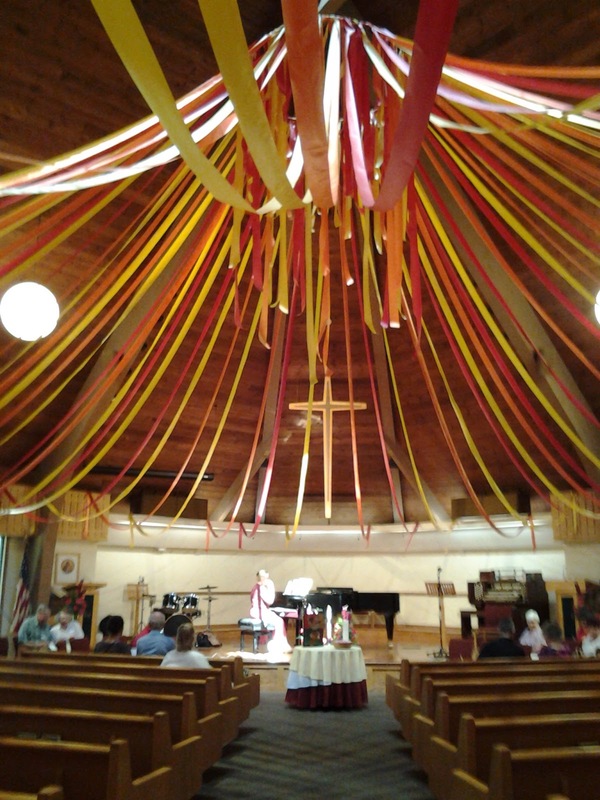 During the Easter homily Francis affirmed women as the first witnesses to the Resurrection. "This tells us that God does not choose according to human criteria...The women are driven by love and know how to accept this proclamation with faith: they believe, and immediately transmit it, they do not keep it for themselves." Women who have accepted the call from God to priesthood and who have become women priests want to share "the joy of knowing that Jesus is alive, the hope that fills their heart." The Association of Roman Catholic Women Priests calls on Francis to embrace the full equality of women, including women priests. Women priests are answering the call and our movement is growing since it began in 2002 with the ordination of seven women on the Danube. There are now 150 in our Roman Catholic Women Priests' Movement in the world, including 100 in the U.S. living and serving in over 60 inclusive Catholic communities and welcoming all to receive the sacraments. According to a recent CBS Gallup Poll, over 70% of Catholics in the U.S. support women priests. There is no shortage of vocations as women are now saying "Yes" to this call and are being ordained. Two women will be ordained priests and two will be ordained deacons in Falls Church, Virginia in June. "Twas the Night Before Pentecost"/Enjoy! Link to mailing addresses for Greg Obed, Sister Megan Rice, and Michael Obed, social justice advocates who broke into nuclear weapons facility to witness for non-violence and justice. In her reflection Olga Lucia Alvarez (the first Roman Catholic Woman Priest in Colombia) is connecting Pentecost to the commissioning of all of the baptized and to the power of the Eucharist that is essential to our strength as a people who are agents of change, who live the reign of God and the divine in our humanity as Christ empowers us. 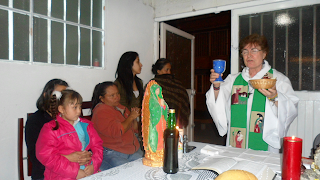 She says without the Eucharist there is no justice or deep caring possible by us or through the church. She prays for the healing and the renewal of the church through the Eucharistic power of the Holy Spirit, wisdom Sophia this Pentecost. 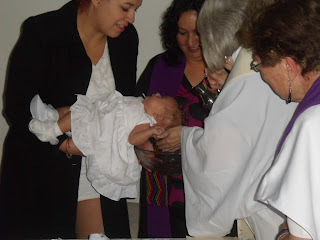 Olga Lucia begins with the picture of our women priests baptizing a baby girl who is Aida's grand daughter. Olga Lucia notes our jobs and the jobs of parents and grandparents a nd God parents to raise this child in a faith of love and justice. She then shows the community of Janice and Rosemarie at prayer and then shows excerpts from the life of Saint Laura, the first Colombian Saint to be canonized on Sunday past by Francis I. The point is, she notes, that the people of God are empowered with Pentecost power to create justice and wipe out poverty here and now. What a wonderful sacramental meditation for all of us.